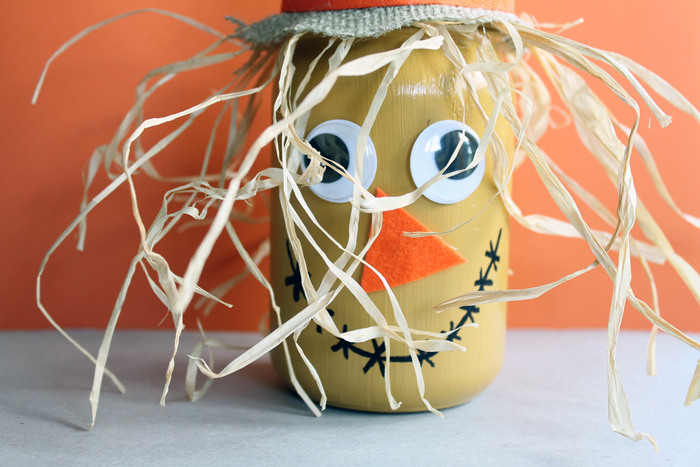 Y’all are going to love this scarecrow jar fall craft idea. 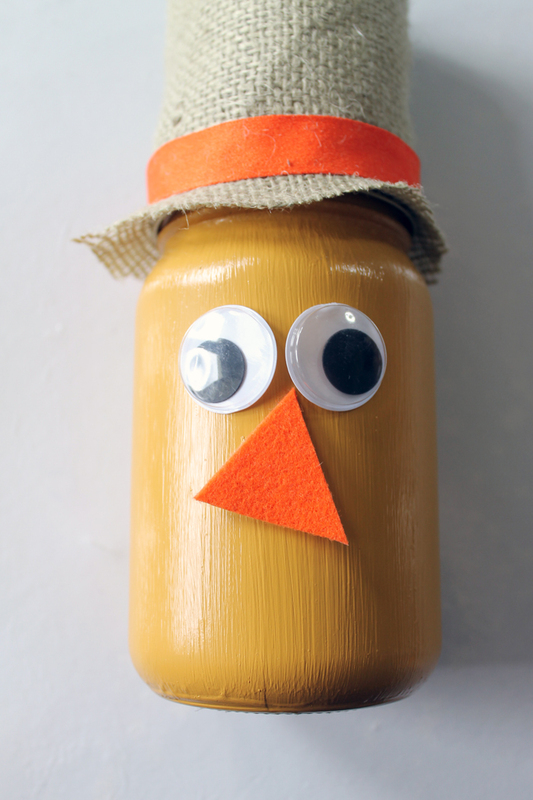 I have a thing for scarecrows this year so I just had to turn a mason jar into a cute little scarecrow. This is a great project to do with the kids or make a few for yourself to add to your fall decor. You can also add a gift inside for a fun way to give a hostess gift for fall parties. 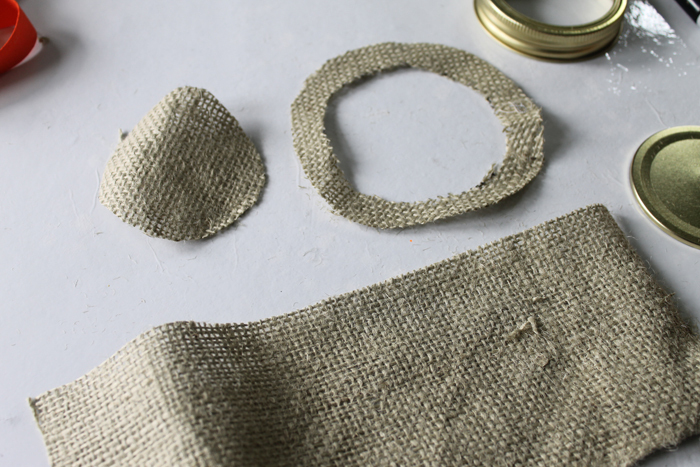 These are super simple to make so grab your mason jars and some burlap and get started. Some links may be affiliate links which means you do not pay anymore but a portion of your purchase will go to support this site. 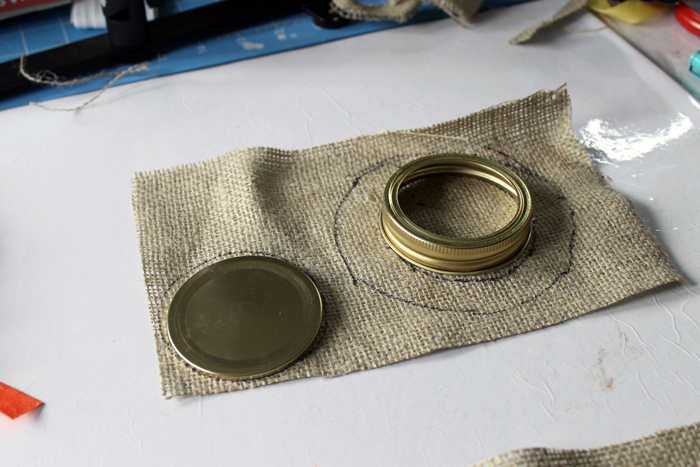 Start with a scrap piece of burlap and trace your mason jar lid as shown below. I used a larger circle template to trace the outer edge of the hat brim. Cut out the pieces with scissors. 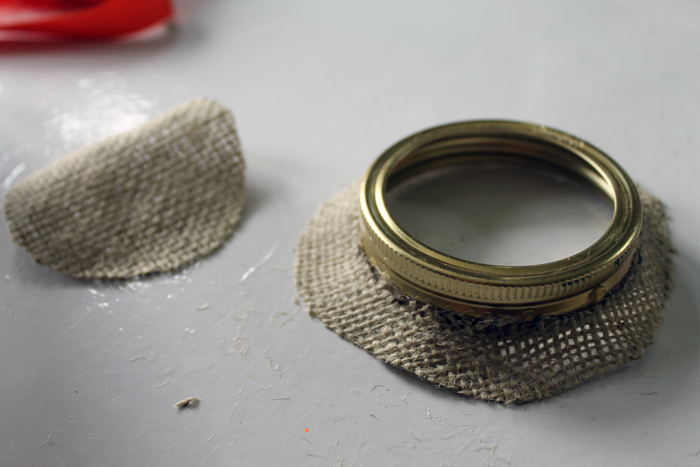 Add the brim to the mason jar lid with hot glue. BE CAREFUL! 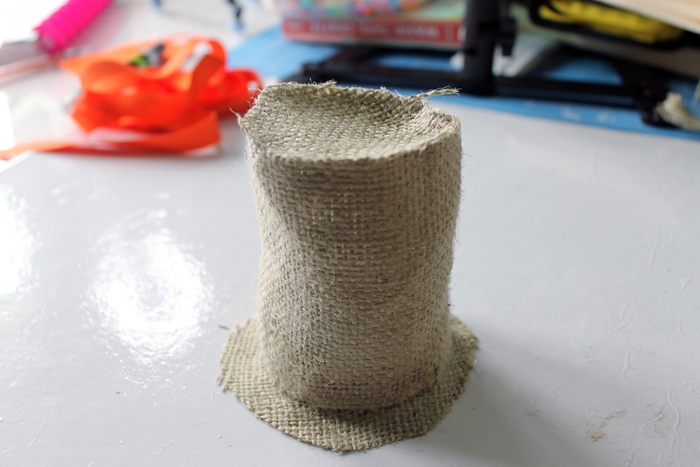 The hot glue will go through the burlap and burn your fingers. One tip is to use finger guards if you have them. 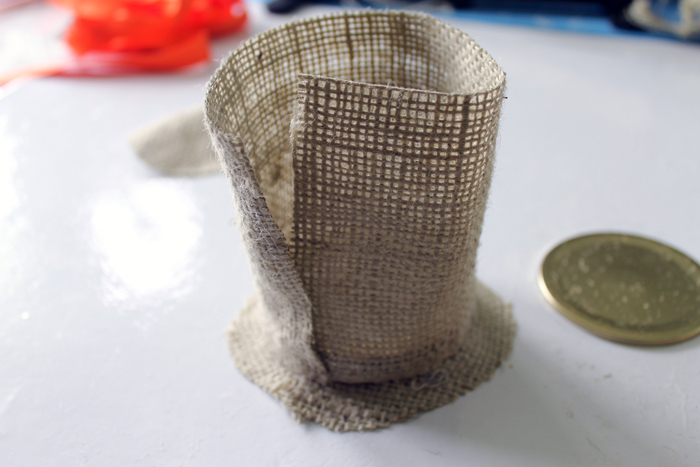 Cut a piece of burlap about 3 1/2 inches by 9 1/2 inches. Place around the lid as shown below. Hot glue around the bottom edge. Hot glue up the seam in back then add on the top again with hot glue. Add on the ribbon with hot glue. In the meantime, clean your jar well with rubbing alcohol then paint with a craft paint made for glass. It may take a few coats. Allow to dry completely then start adding on your eyes and felt nose with hot glue. Use the black paint pen to draw on a mouth as shown below. 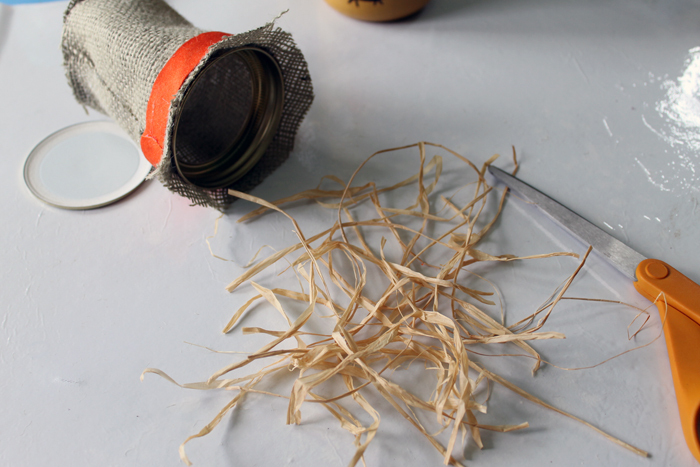 Cut short strips of raffia with scissors. 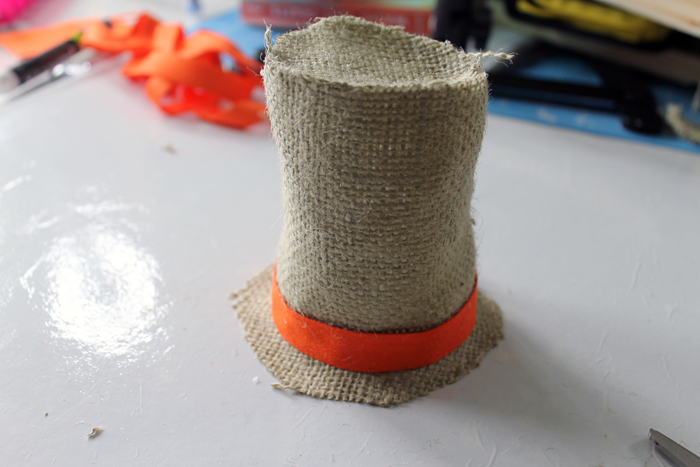 Use hot glue to add them around the hat. 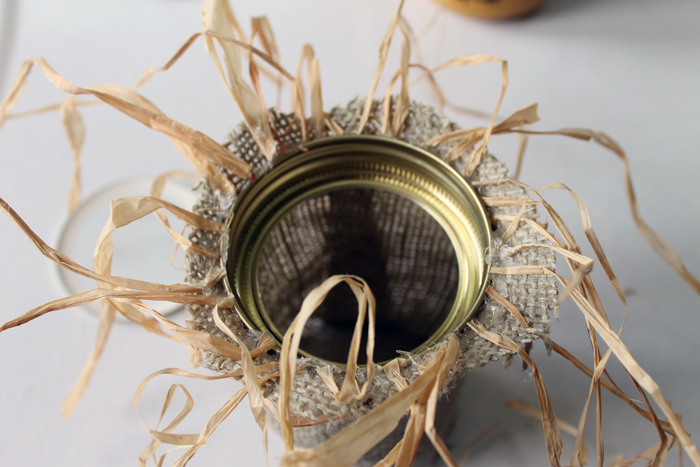 Add the hat to your mason jar and trim the raffia if desired. 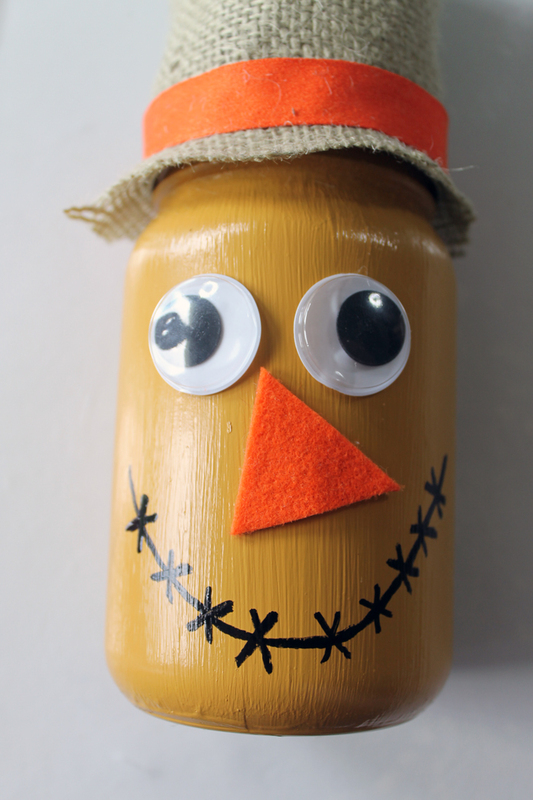 This scarecrow jar is complete and ready for your home! 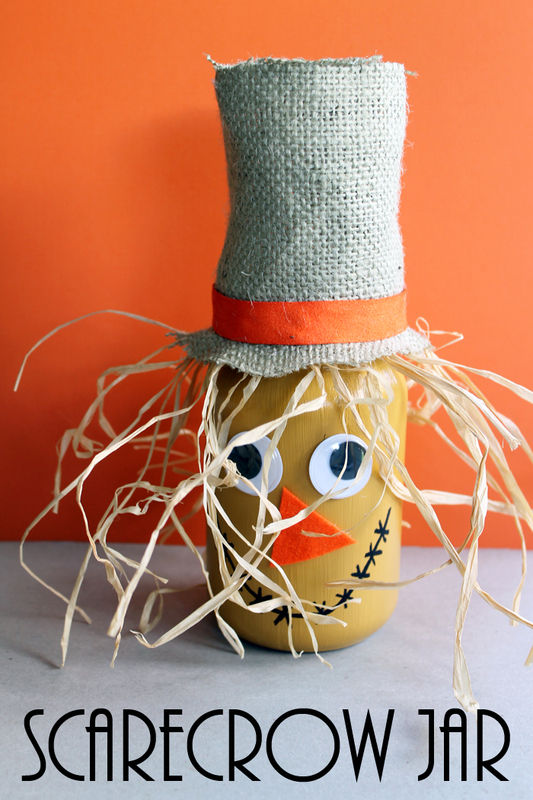 The kids will love this fall craft idea and this little guy sitting around your home this autumn. 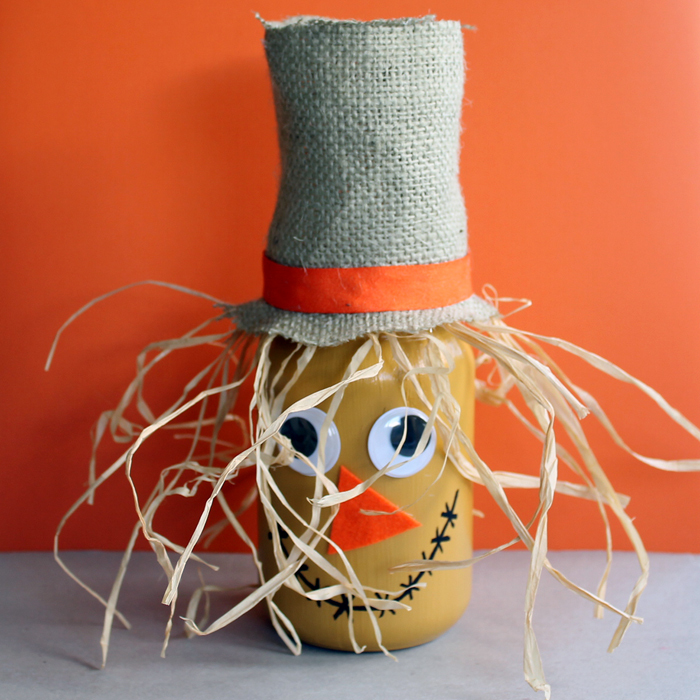 Or click here for lots of scarecrow craft ideas! next post: Fall Wreath – a quick and easy idea! This is such a cute and simple tutorial (that I would never have thought of on my own!). This is a really cute little project. You could easily do this with children on a craft afternoon. Autumn crafts are always the best! This is super cute! This is adorable and easy enough I could probably even make it! Ha! Posts like this would be great for the Waste Less Wednesday Blog Hop: http://www.skipthebag.com/2016/08/waste-less-wednesday-blog-hop-3.html Thanks! Well that’s just adorable. I pinned it! He is so cute and looks like it was a lot of fun to make. Too cute girl. I love it and so much better than what you see at the store. Love! He is just the cutests fall mason jar craft I’ve seen lately! This is my Featured post for the new Merry Monday party starting Sunday night. Thanks for partying with us.